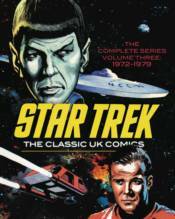 This third volume reprints all comics from 1972 to 1979 and concludes the 3-volume series that presents the complete Star Trek UK comics. Bonus material includes various one-shots and annuals, as well as the strips created for various merchandise and toys. Star Trek expert Rich Handley provides the second half of a detailed encyclopedia of all things Star Trek from these British comics. Exploring the minutiae is half the fun of enjoying a franchsie, and when it comes to Trek, there's no end of trivia to devour.